South Korea LOVES Hello Kitty! Of course I myself have a soft spot for the cute kitty in pink too. When I first made it to Korea I knew I had to get to one of the Hello Kitty café’s just to have the experience. Luckily two new friends also shared my same love of Hello Kitty and have two little girls of their own that they wanted to share the experience with as well. We left a little before 9AM this morning and caught the train in on line one switching lines in Jongno-ga to line three. We took line three all the way to Madu Station, where we got off and went out exit 4 and walked a few blocks taking a left at the Kim’s Club you will see a New Core Outlet Mall on the right we continued walking until seeing the Western Dom shopping area located on the right-hand-side of the street. I made sure to take some reference points for anyone who is planning a trip to check out the area or the Hello Kitty Restaurant. Also Hello Kitty does not open until 11:00AM so you will want to plan accordingly. Once we got to Western Dom I was pretty excited! We all were pretty impressed and thought this place was pretty awesome! Western Dom is located in Ilsan, South Korea. It’s got a mall vibe but it’s open and exposed to the outdoors at each end plus has some light traffic running through the center of it. Where do I begin? Oh, Yes! Tons and tons of places to eat, shop, play games, grab coffee, and of course visit Hello Kitty! I can’t wait to drag Larry back so he can check out the area too! We had a bit of a struggle trying to locate the Hello Kitty elevators because it’s on floor three of the Western Dom building. I’m not sure if it was because we were so into checking out what all Western Dom had to offer or just the fact that we were looking so hard…nevertheless we ended up walking right past the doors twice. On the third attempt we saw the Hello Kitty logo on the glass doors and the small room that have three elevators inside. YEY! We finally made it! The elevator doors opened into another room that had lockers all along the wall. You could put whatever you needed to store and take the key for free while you were inside. Be prepared that you have to remove your shoes, so bring your socks, (Hello this is South Korea) and put on red slippers that they provide you with to be able to enter. We got there a bit after lunch-time and we were starving after the journey. We immediately decided to order food and let the girls run a bit while the food was being prepared. I opted for chicken pilaf, the two ladies I was with both got pasta carbonara. The little girls shared a plate of chicken cutlet and we had two orders of garlic bread. We had a ton of food! Everything was very good. The ladies said the bacon really stuck out in the pasta dish but that they enjoyed it. Hello Kitty provides the little girls with juice boxes and they bring out a side of pickles too. The total bill for our lunch and the cost for the two girls to play was $60,000 won so roughly $60.00 US. The plates at Hello Kitty range from $9,000 won upwards to about $13,500. They offer a desert menu that features a mud pie with a small scoop of ice- cream or a brownie paired also with a small scoop of ice-cream. Drinks are pretty typical cola, cider, coffees, teas, wine, beer, etc. The play area is really nice for the children. There is a huge pink castle that you can go inside and play “house” in. Inside the castle Hello Kitty furnished with little pink and white tables, fake foods to play with, blocks, etc. There is a tube that runs inside the castle that the children can crawl through and it’s completely see through so you can keep an eye on your little one. There is a ball pit, slide, a motorized palm tree merry-go-round, little cars for the little ones to get inside and “drive around” in, a library, dress-up area where they have an array of dress-up clothing, a train that children can take around a small track, a baby-room if you have a teeny one that needs to take a nap or be changed, little children’s rest-rooms that feature smaller toilets and sinks, large party area for those that are throwing a party or event, and of course a gift-store area. We had a great time and it was totally worth the trip! Feel free to check out the website (although it’s in Korean) http://www.hellokittytown.co.kr/ or you can check out the pictures included above. As I said I cannot wait to drag Larry back to check out the area as well as hit up one of the Hello Kitty Café’s located around Seoul. 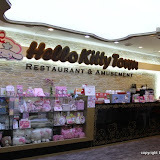 I also plan on making a stop at the Hello Kitty store located nearby in Uijongbu. My brother suggested I would possibly like this web site. He used to be entirely right. This publish actually made my day. You can not believe just how so much time I had spent for this information! Thanks! Great! We hope we can help anyone searching for info on S. Korea 🙂 there is just so much to do and see here!! Could you message me with any pointers on how you made this blog look this cool , I would appreciate it. Hello Kitty Café looks awesome! Would love to visit one!